While I tested OpenGL ES with tools like glmark2-es2 and es2gears, as well as WebGL demos in Chromium, I did not test OpenCL, since I’m not that familiar with it, except it’s used for GPGPU (General Purpose GPU) to accelerate tasks like image/audio processing. 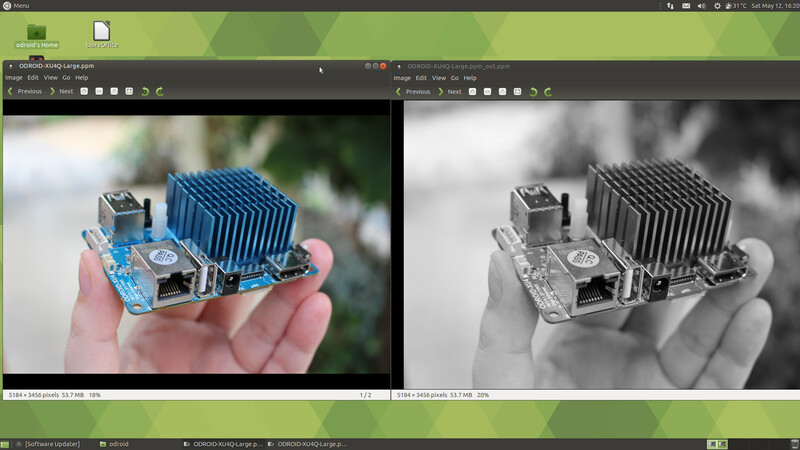 That was a good excuse to learn a bit more, try it out on the board, and write a short guide to get started with OpenGL on hardware with Arm Mali GPU. The purpose of this tutorial is to show how to run an OpenCL sample, and OpenCL utility, and I won’t go into the nitty gritty of OpenCL code. If you want to learn more about OpenCL coding on Arm, one way would be to check out the source code of the provided samples. Since I did not know where to start, Hardkernel redirected me to a forum thread where we are shown how to use Arm Compute Library to test OpenCL on the board. It could process the photo (5184 x 3456) in less than 6 seconds. If we look at the resulting image, we can see the OpenCL convolution converts the image to grayscale. It took a little over 10 seconds, so almost twice the time used by the OpenCL demo. The PPM image files are however over 50MB, so part of the time is used to read and save the file from the eMMC flash. Repeating the tests provide similar performance (~6s vs ~11s), so it may be negligible. The last sample cl_sgemm manipulates matrices. The main goal of the three OpenCL (cl_xxx_ samples) is to show how to use OpenCL Convolution, Events and SGEMM (Single-precision GEneral Matrix Multiply) using the Compute Library. You can also play with other samples for NEON and OpenGL ES, and Arm Community published a blog post explaining how to run neon_cartoon_effect on Raspberry Pi , and explaining the source code in details. You don’t actually need an RPi board for that as any Arm board with a processor supporting NEON should do. Not what I expected. Luckily, setting up clinfo is explained in ODROID Magazine, so let’s have a try. That’s a lot of information, and it shows one platform with two OpenCL devices (both Mali-T628) supporting OpenCL 1.2. That’s all for this little getting started guide. Now if you actually want to make something with OpenCL, it’s time to read Arm Compute Library documentation, and other resources on the web. I wonder why everyone is using swap when it’s so easy to activate zram on Ubuntu? Just mentioning since comparing ‘convert’ execution times with the OpenCL examples is not comparing efficiency of CPU vs. GPU but most probably just unoptimized vs. optimized software in this case. So gm is much faster, but not related to Q8 or Q16. Copyright (C) 2002-2018 GraphicsMagick Group. > So gm is much faster, but not related to Q8 or Q16. Thank you for the tests which simply show one more time that ImageMagick is just slow as hell. When I tested last time with Q8 vs. Q16 I got a performance improvement of 20% for Q8 (with a task that involved loading the rather large images through a slow GbE network so no filesystem buffers/caches involved as in your example). So by using GraphicsMagick vs. ImageMagick now CPU processing easily outperforms OpenCL on the GPU. This should be taken into account by people really interested in doing high performance image processing (or other tasks that could run via OpenCL on the GPU). BTW: ‘Converting to grayscale’ can be done in many ways. The most primitive and fastest is to add the values of the 3 RGB channels and divide by 3. A more complicated variant would be to transform the RGB image into a ‘device independent color space’ and then reducing saturation to 0. This is way more ‘expensive’ in terms of processing power but results in a slightly better image result. Next improvement is to take ICC profiles into account (assuming something generic like sRGB for source and destination images if the fileformat doesn’t support color profiles). Usually this will result in a pretty dark image so adding ‘-normalize’ or inverting the resulting image helps in spotting differences. The function it performs depends on the filter values used. Since the operation is scaler (single value) and not vector (multiple values), the output is typically represented as grayscale. Another way to avoid costly swapfiles is to lower the -jN option to the compiler. In this particular case -j4 would have utilized the big cores and likely not needed the swapfile. Good point, but I think the build failed at the link stage, which I believe only uses one core. I’m compiling the thing with -j1 to see if it goes through, then I’ll try with ZRAM enabled. Pretty sure clinfo is not reporting anything but support for OpenCL 1.2 — there is no 2.1 support listed. Also, I find it odd that the MP6 GPU is listed as *two* devices: one with 4 compute units (MPs) and one with 2… I’ve never seen that before! Since we have two devices, I wonder if the selection of the device matters, especially one has 4 compute units, and the other has both, or do OpenCL code just run on both at the same time? I really depends how the client code was written — while a CL kernel would not care on how many devices it would run, the client-side context and queue setup would need to be carried properly for multi-device dispatch. For client code that was not written to run on multiple devices, the user has to make sure they run the test on the most performant device — in this case on the 4-CU one. @ASM, Indeed, the T628 in the exynos 5422 is a 6-cluster setup, which apparently comes at 4 + 2 CUs. I was pondering not long ago how to split a workload for it, and one inevitably gets to a 3-way split, which is, well, odd for most workloads. @BLU, thanks for confirming the 4+2 split! I didn’t know and don’t understand why ARM would ever split their GPUs ! This may be useful for a reliable embedded application but it’s still odd. It’s a challenge to program and coordinate multiple GPUs. Furthermore, OpenCL 1.2+ already supports a “device fission” feature (clCreateSubDevices()) in case you wanted to logically split the CL device into sub-devices. Thanks for the G71 clinfo — that’s the first time I see it. ‘Max work group size: 384’ — apparently ARM have a thing for the number 3..
5) Run. Fails: Great Firewall of China is blocking dataset download. Fortunately, it’s on Baidupan (Chinese Google Drive). Modify code slightly to use downloaded data. About 15s/epoch, but with a far smaller network. Eliminating that layer did away with a lot of weights and the network’s capacity to fit the data, with accuracy of only 98,35% after 12 epochs (CF 99.25% reported for the original network). That said, PlaidML can turn even an aging laptop’s GPU into a ‘just works’ platform for experimenting with fairly small, fairly standard networks. Love to hear how it works on cheapish new ARM devices! That name is familiar… It’s been a while. Welcome back! Thanks – I’m hoping to tempt you into trying this on some ARM boards from that big stack you must have in Chiang Mai! The networks they can train might be limited (big neural networks takes a lot of memory). But some ARM GPUs may quite useful for inference (predicting with pre-trained models). PlaidML’s support of ONNX (an open format to represent deep learning models, https://onnx.ai/) should make it fairly easy to test how well they work. In particular, the Intel Movidius and AAEON UP AI Core only have 512-1024MB ram, which I think (?) is comparable with the RAM ARM GPUs can often access. So some people may find projects they thought would need a Movidius/UP AI Core/Jetson will work on other cheaper devices.